As the weather gets hotter, I’m digging out all of my sebum control skincare and makeup products in preparation for the summer. 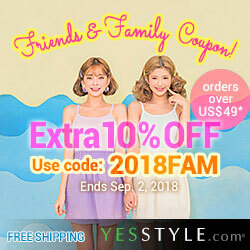 As someone with combination skin type, I’ve found that my T-zone and cheeks can get super oily in the hotter months. So a combination of sebum control skincare and makeup products help best in controlling my excess sebum. One of my favorite sebum control setting powders has been Innisfree’s No Sebum Mineral powder. However, when I learned that other brands also have sebum control setting powders, I decided to check them out as well. 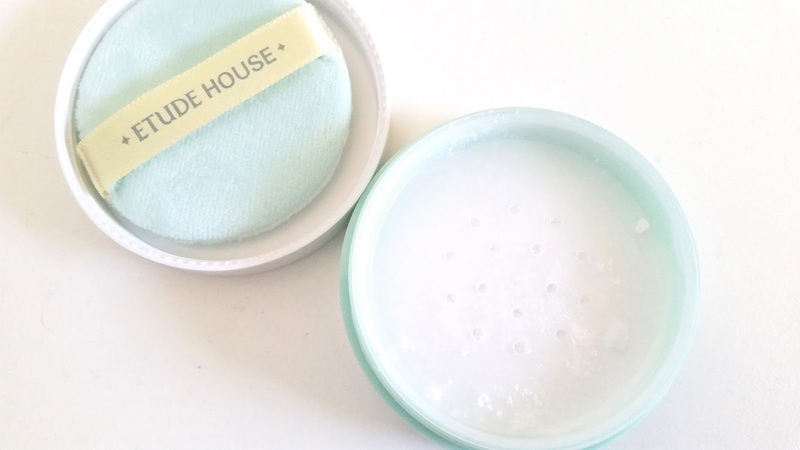 That’s why I purchased this Etude House Zero Sebum Drying Powder. Let’s get to know it! Product Description: A finishing powder that works to control sebum. The powder is applied as the last step of makeup. It can provide clear and shine-free skin without dryness of flakiness. To Use: Use the powder puff provided or a powder brush to apply. Pour out some of the powder and dab the puff or powder brush on top. Dust off excess then apply it lightly wherever needed. Ingredients: Silica, mica, caprylic/capric triglyceride, hydroxyapatite, dimethicone/vinyl dimethicone crosspolymer, methicone, citrus aurantium bergamia (bergamot) fruit oil, citrus limon (lemon) peel oil, eucalyptus globules leaf oil, pinus sylvestris leaf oil, citrus aurantifolia (lime) oil, citrus aurantium dulcis (orange) peel oil, organum vulgare leaf extract, chamaecyparis obtuse leaf extract, salix alba (willow) bark extract, lactobacillus/soybean ferment extract, portulaca oleracea extract, cinnamomum cassia bark extract, scutellaria bajcalensis root extract, gossypium herbaceum (cotton) extract, 1,2-hexanediol, isoceteth-10, glyceryl caprylate, water, butylenes glycol, saccharide isomerate, phenoxyethanol. Packaging: While many of Etude House’s products have cute designs, I think this one has a more simple and practical design. The packaging comes with information about the product and the manufacturing date can be found on the bottom of the product. When you open the container, you’ll find a powder puff inside and a sticker that seals the openings. The plastic container is also lightweight and travel friendly. Scent: The Zero Sebum powder has a citrus scent with hints of herbal notes. Since there’s no additional fragrances added to the powder, I’m guessing the scent is due to all the citrus and herbal oils. The scent also has a slight bitterness to it. Color: The powder looks white in color, however, when applied it doesn’t look white on the face. 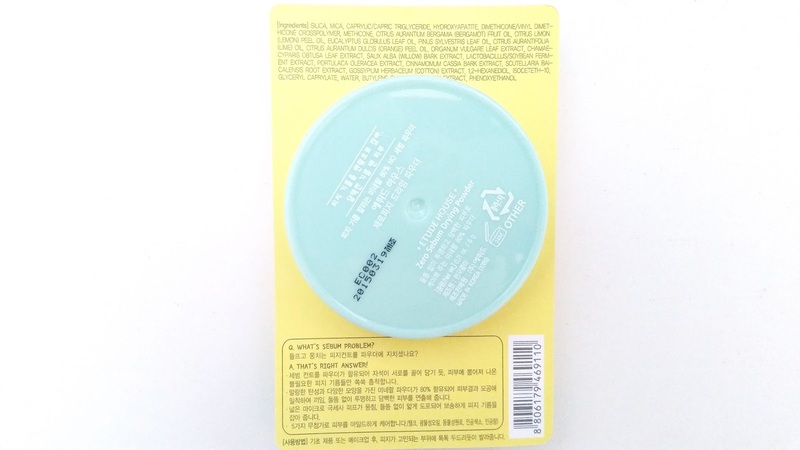 Texture: The powder is very fine and its texture is comparable to Innisfree’s No Sebum Mineral Powder. 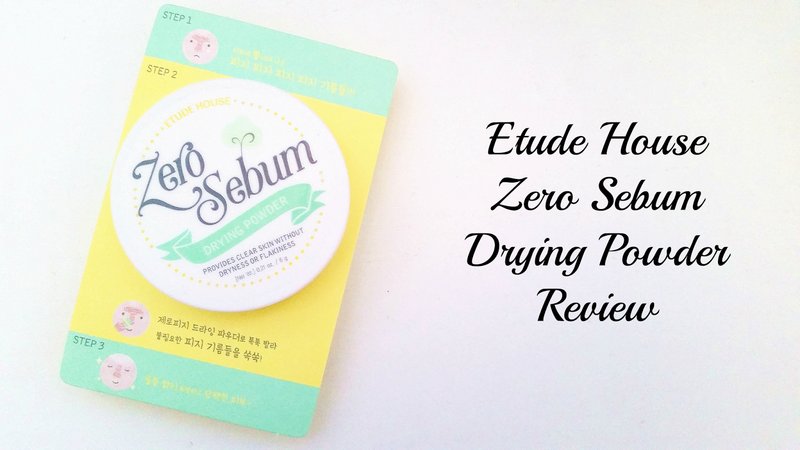 Michelle’s Thoughts: I had a feeling the Etude House Zero Sebum Drying Powder would work similarly to Innisfree’s No Sebum Mineral Powder and sure enough that is the case. I will do a comparison of both products below, but for now I’ll share my thoughts on the Zero Sebum Powder. I like the Zero Sebum powder, but not as much as the Innisfree No Sebum Mineral Powder. The scent is one of the reasons why I don’t love it. The Zero Sebum powder has a citrus herbal scent; however, it has this slight bitter scent to it as well. It’s not super noticeable but sometimes the scent just really bugs me. The other downside for me is the powder puff or the number and size of the openings where the powder comes out, depending on how you look at the issue. The way the openings are situated in the container make it that when you try and get powder on the puff, the powder only gets onto certain spots of the puff. So, you end up with a lot of powder in certain spots and no powder elsewhere, making it difficult to apply. I think the design would have been better with more openings and smaller in size (holes) where the powder can come out, so the powder comes out more even. How the container is designed now, the puff is not the best applicator to apply the loose powder with, so it’s a bit useless for me. I wish they came with a powder brush instead. The Etude House Zero Sebum Drying Powder claims that it doesn’t cause dryness or flakiness when applied. While that is true for the most part, I found that if I have a dry patch and apply the powder after I apply makeup, sometimes it can make the dry patch more noticeable. So if I choose to use this powder, I always have to make sure make sure my skin doesn’t have any dry areas. The lasting power of the Zero Sebum powder is okay. On hotter days I have to do touch ups more frequently, usually after 3 to 4 hours. However, on other days, the powder can hold up to 6 hours before I need to touch up. 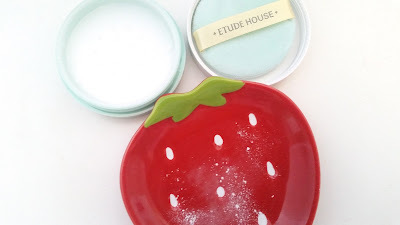 The Zero Sebum Drying Powder from Etude House is similar to Innisfree’s No Sebum Mineral Powder; however, there are some important differences that set them apart. The first difference is their ingredients… Another difference is their size. The Zero Sebum powder is a bit bigger than the No Sebum Mineral Powder from Innisfree. 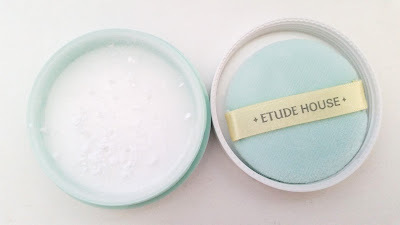 Not only is the container size larger but the Etude House powder also contains 1g more product. 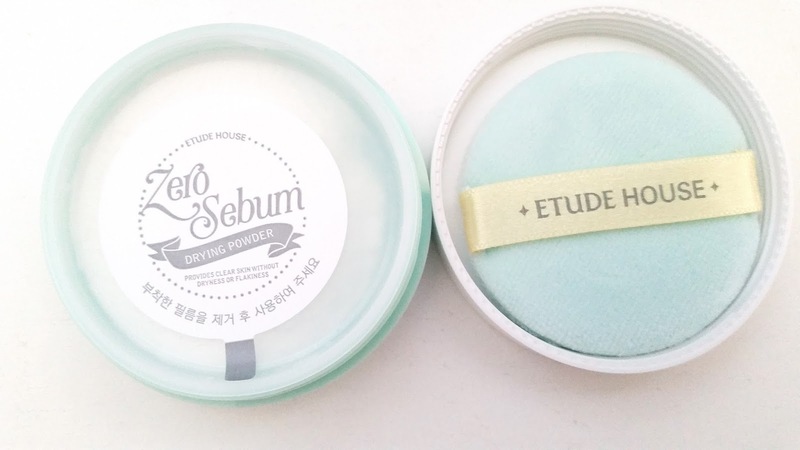 However, since the Zero Sebum powder from Etude House costs a bit more than Innisfree’s No Sebum Mineral Powder, price wise, both powders comes out about the same. The 2 loose powders also have different scents as well. While Innisfree’s No Sebum powder has that signature Innisfree scent, which is a mix of green tea and floral notes with hints of herbal notes (a bit of mint too). Etude House’s Zero Sebum powder has a citrus herbal scent with bitterness to it. I found the Innisfree No Sebum powder also has a slightly longer lasting period for me than the Etude House Zero Sebum powder. Final Thoughts: This Etude House Zero Sebum Drying Powder is pretty good but I think I’ll still stick to my Innisfree No Sebum Mineral Powder for now. While the 2 products are comparable, there are a few minor differences that make me love the Innisfree powder better. 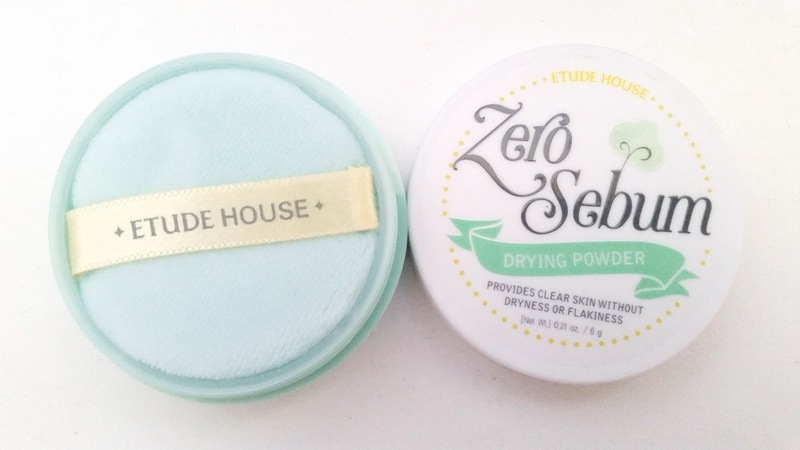 I do think this Etude House Zero Sebum powder might be worth a try for those who weren’t fond of the Innisfree one (for whatever reason). Will I repurchase this product? Probably not. It doesn’t beat my favorite Innisfree No Sebum Mineral Powder, so no need to change it. Do I think this Etude House Zero Sebum Drying Powder is worth a try? Maybe, if you like what the product has to offer and somehow the Innisfree No Sebum powder didn’t work for you, give this one a try. It might work out better for you.